I wasn’t expecting to see you for three more days, but what the hell, this post couldn’t wait. So this has been the most exciting craft beer Sunday-Monday combo I have ever been a part of and I had to share some details. This will be fairly brief but very fun. It started last week with the arrival of several delicious fresh hop beers (I will go into more detail about fresh/wet hop beers on Thursday) and ramped up with a pleasant beer dinner with Brooklyn Brewery’s brewmaster and craft beer bon vivant Garrett Oliver. Throw in the Surly Brewing “Wet” release party along with some other tasty local releases and you have a wild 48 hours. So the wet hop excitement started last Tuesday when Brau Brothers‘ 100 Yard Dash hit the shelves in the Twin Cities. This is the freshest wet hop beer you can get (as far as I know, and definitely amongst production breweries in the Twin Cities market) as the name alludes to, the hops are picked from their bines (yes I mean bines, not vines, again more on Thursday) on the Brau Brothers’ estate and hustled across the lot to the brew kettle (hence 100 yards). Last year’s batch was excellent and definitely the most bitter hop bomb of the fresh hop beers I tasted. I’ll save the details of the review for Thursday, but let’s just say they didn’t disappoint this year. Final beer: Brooklyn Companion- a wheat wine with a very present ripe banana flavor and what seemed to remind me of belgian yeast aromas and sweetness, similar to a darker Belgian trippel style, very interesting. Amongst all of the good food and beer was Garrett’s lively discourse on beer and it’s history all while promoting the recently published The Oxford Companion to Beer (of which he was the chief editor). 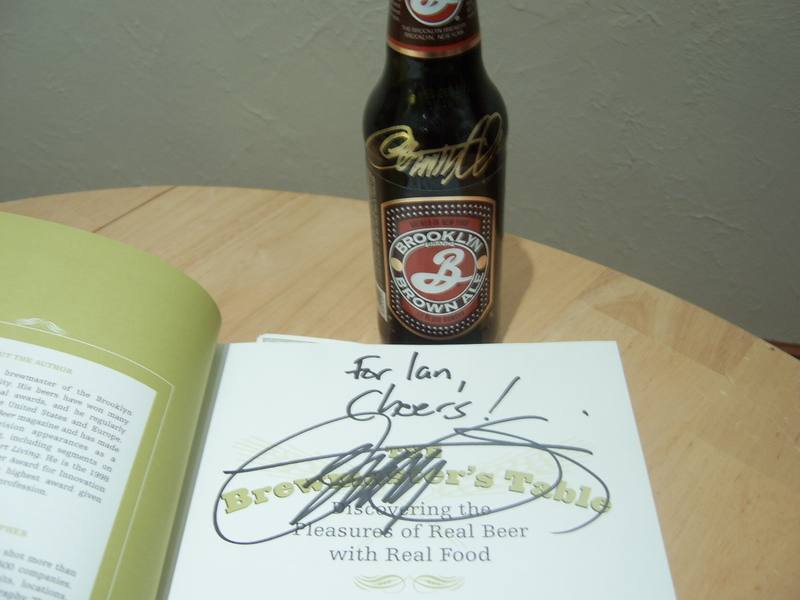 I was fortunate enough to get him to sign my copy of his book The Brewmaster’s Table which is a great resource book which I will surely cite during future posts and I highly recommend. As if spending time with the prodigious author and brewmaster wasn’t enough, I got to do it again on Monday evening at the Four Firkins during a book signing and sampling of Brooklyn’s Concoction. The Concoction is based on a recipe for a cocktail called “Penicillin” which includes ginger, honey, lemon and in the case of the beer, peat smoked malt. The beer was very easy drinking, lightly effervescent and refreshing with the ginger, honey and lemon on the front of the palate and the peat smoke mixing them all together at the end for a totally unique beer flavor experience. Before any of that happened however, I had the chance to snap up some more local wet hop beer from the esteemed Minneapolis Town Hall Brewery (which recently took home 3 medals in the Great American Beer Festival). 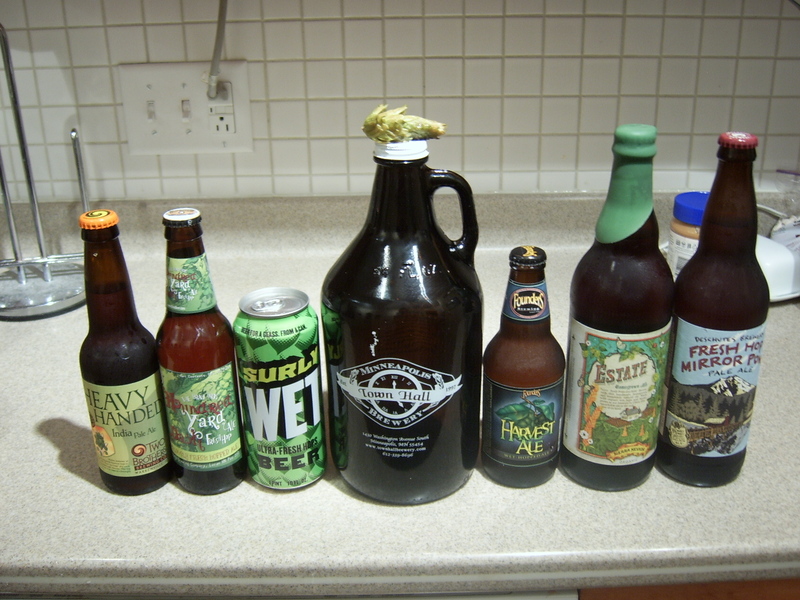 I was able to get one of only 60 growlers produced from this year’s batch (each of which included a hop cone, how cool!) and share some with some friends after the Garret Oliver tasting. Review of the beer on Thursday. To cap off an entirely awesome and overwhelming craft beer weekend(ish) I stopped into Tracy’s Saloon for Surly Brewing‘s release of “Wet” their fresh hop beer. It was, as expected, full up with Surly Nation devotees with Omar Ansari and brewmaster Todd Haug on hand to usher in their most recent release. Two for one Surly Wet, hell yea! So that brings me to now, whew. I’m sitting down to enjoy my Town Hall before it flattens out (I’m dry hopping this one as I drink it with that massive hop bud) and feeling very fortunate for all of the wonderful beer and events that the Twin Cities has to offer craft beer lovers. Get ready for these next couple of months because there are going to be some huge releases that you won’t want to miss. Posted in Special Posts and tagged beer dinner, brau brothers, Brooklyn Brewery, craft beer, four firkins, fresh hop, Garrett Oliver, pairings, surly, town hall brewery, wet hop. Bookmark the permalink. So they have all these beer events in Chicago where you can go to a bar, buy a certain beer, and take home a collectible glass with it. (I might go to one for Duvel this Thursday to get a glass that matches the beer you gave me.) But a lot of them are glasses with stems. Why is that? Is it just certain beers that you should drink with stems or what? Hey Jim! The Duvel event would be awesome because their glass is one of the best overall beer glasses and the one I use for all of my samples (for the most part) as it really allows you to get a good look at the color and a wide mouth to release the aromas. Generally glasses with stems tend to work better for tasting beers because they are purposely shaped to highlight the aroma, color and flavors of the individual beer. The difference between tasting a beer out of a shaker (standard pint) glass vs. a goblet (like the Duvel one) can be pretty dramatic, so I would recommend using a wide mouthed glass with a rounded goblet for most beers, although a deep narrow “V” shaped glass can work well for light lagers like pilsners. Thanks for the comment and I hope all is well in Chicago and that your job search is working out. Talk to you again soon.